Indians abroad today celebrated the 60th anniversary of India’s independence amid patriotic fervour with flag-hoisting ceremonies, rendition of the national anthem and cultural programmes. Queen Elizabeth II and British Prime Minister Gordon Brown have congratulated India on the 60th anniversary of its independence, hoping that Indo-UK ties will remain permanently intertwined. AS the nation celebrated its 60th Independence Day, top opposition leaders from across Pakistan aligned in the All-Parties Democratic Movement (APDM) launched their anti-Musharraf campaign last night with a public rally in Rawalpindi's historic Liaquat Bagh and vowed to resist his re-election bid. Bofors accused Ottavio Quattrocchi today walked free out of Argentina after a six- month legal battle following India’s failure to appeal against a court’s decision not to extradite him. A British woman said today she was left speechless after learning she had scooped the EuroMillions lottery jackpot of 52.6 million euros ($ 70.9 million). Former Prime Minister Benjamin Netanyahu easily won the re-election as head of the rightist Likud Party and pledged on Wednesday to reclaim Israel’s leadership. President Mahmud Abbas issued a decree today that effectively excludes the rival Hamas movement ruling Gaza from future elections, further widening the gaping Palestinian divide. Over 200 Indians participated at an event held at the Indian Embassy in Beijing, where New Delhi's envoy to China, Nirupama Rao, unfurled the national tricolour. The Ambassador planted a cherry blossom sapling to mark the occasion and read out the address to the nation by the President of India delivered on the eve of Independence Day. The day was also celebrated at the Consulate General of India in Shanghai, China's commercial capital. In Hong Kong, the Consulate General of India celebrated the day with the consul general addressing a large gathering of people from the community. In Herzliya, Israel, Indian Ambassador Arun Kumar Singh hoisted the national flag at a ceremony attended by a large number of Indians. 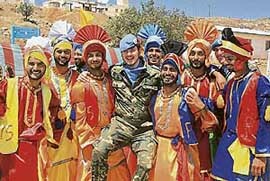 Indian troops serving for the UN in Golan Heights staged Bhangra and ‘Namaste Israel’ dance group performed to the tunes of “Mera Desh Rangila” on the occasion. More than 400 Indians thronged the India House in Malaysian capital city of Kuala Lumpur to witness the unfurling of the national tricolour. “It is the largest-ever number of Indians who have come to observe this day,” an Indian High Commission official said comparing the turnout to that of the past few years. A tourism delegation from Sikkim, including the state Forest Minister, also attended the brief ceremony. Almost all the Indians present were expatriates working here who came with their families. Similar functions were held across southeast Asia in Singapore, Jakarta, Manila and Bangkok. Indian envoy to Pakistan Satyabrata Pal hoisted the tricolour during an Independence Day celebration at the Indian High Commission in Islamabad. Deputy High Commissioner Manpreet Vohra, senior diplomats, staff and their families took part in the function. After hoisting the flag, Pal read out the excerpts of the speeches made by President Pratibha Patil and Prime Minister Manmohan Singh to mark the occasion. Washington: India's 60th Independence Day was celebrated with gusto, with Indian ambassador Ronen Sen hoisting the national tricolour at the Embassy amid a large gathering of Indians settled in the US. Sen then read out Prime Minister Manmohan Singh's address to the nation. It was followed by a cultural programme. “The UK is one of the largest investors in India and India is a fast growing and important resource of high quality investment in the UK. Our people to people links continue to grow with over one million people travelling between the two countries last year,” Brown said. Moscow: Lauding India's "impressive" achievements in various fields, Russian President Vladimir Putin today said the South Asian country enjoys "deserved importance and influence" in the world. "We are genuinely happy to see your country's impressive achievements over the years of its sovereign development in economy, science and culture and public and political life," Putin wrote to President Pratibha Patil in a message. They urged Musharraf to quit while vowing to resist his election from present assemblies. From Dubai, exiled premier Nawaz Sharif addressing a huge crowd by the telephone joined them in their call to the embattled General asking him to step down. It was an impressive show of solidarity in support of the federation as leaders of the mainstream opposition parties along with small and big nationalist groups addressed the gathering and pledged to struggle for a civilian-led democratic, federal and parliamentary country in which provinces will enjoy full autonomy. The Pakistan People's Party (PPP) of Benazir Bhutto who has cut a deal with General Musharraf, was missing. The crowd chanted "go Musharraf go". Speakers said their movement was designed to end army's intervention in politics for ever and build a progressive, moderate and modern Pakistan under a vibrant democracy. They included MMA president Qazi Hussain Ahmad, JUI (F) Amir Maulana Fazlur Rehman, ANP president Asfandyar Wali Khan , Tahrik-i-Insaaf chief Imran Khan, PML (N) leader Chaudhry Nisar Ali Khan, Javed Hashmi, Mir Hasil Bezenjo, Rasool Buksh Palijo, Dr Qadir Magsi, Mehmood Khan Achakzai and Raja Zafar-ul-Haq. For some of nationalist leaders, including Rasool Buksh Palijo, Dr Qadir Magsi from Sindh and Mehmood Khan Achakzai from Baluchistan it was the first time to address a public rally in Punjab. They emphasised that democracy and provincial autonomy alone can keep the country united. The speakers blamed military interventions for the current political chaos in the country. They denounced General Musharraf' plan to seek re-election from the sitting assemblies in uniform and vowed to resist it. Sharif called on voters to decide "once and for all" to rid themselves of the military ruler and embrace the rule of law and democracy. " Pakistan cannot be governed with the power of gun. We have to launch the struggle from today to save Pakistan and establish the rule of law," he said amid thunderous applause from thousands of supporters in his first public address since he was exiled in 2000. Rawalpindi’s accountability court on Wednesday reserved the verdict over a petition for reopening of corruption cases against exiled premier Nawaz Sharif for August 17. The petition was filed by the National Accountability Bureau (NAB). The court heard arguments by the NAB counsel Zulfiqar Bhutta. In a petition filed on August 2, the bureau had requested the court to reopen the accountability cases of Hudaibiya Mills, Ittifaq Foundries and Raiwind real state against Nawaz Sharif. Chief Justice Iftikhar Muhammad Chaudhry has said the judiciary would come up to the expectations of the people on the principles of its independence, rule of law and supremacy of the Constitution. Laying the foundation stone of the second phase of the Supreme Court building, the Chief Justice said the recent struggle of the legal fraternity, which also had the participation of the civil society, reaffirmed the commitment to the Constitution of Pakistan. In a related development, the Chief Justice implicitly denied that Lt General Hamid Javed (retd), chief of staff to President Musharraf met him as reported in a section of the Press. In another significant development, the Chief Justice did not attend the flag-hoisting ceremony at the Convention Centre on the occasion of Independence Day where he was likely to come face to face with Prime Minister Shaukat Aziz who hoisted the flag. However, according to sources, the CJP after his reinstatement had decided that he would not meet or socialise with government officials and would not attend any official engagements. He also did not attend the Independence Day celebrations at the President House on Monday night despite being invited along with his wife. The 69-year-old businessman left for his home in Milan in his native Italy. His passport was returned by the Argentinean authorities last week. Speaking at the airport, Quattrocchi told PTI, “Unfortunately my friendships made me the target of all sorts of political attacks that may not be aimed at me, but at people I was friends with. The CBI has gone out of its way, breaking every rule of honest conduct to go after me in what has clearly been a political persecution. “I have won every single case brought against me in a court of law. Both the Malaysian and Argentine judiciaries have (asked) India to pay costs to me. After 22 years I think it is time the CBI closes the case, which has become more of an obsession and where not a single iota of evidence has been produced to support any charge of wrongdoing,” he said. Information on the case has been closely guarded since the failure of the CBI’s extradition attempt in Eldorado on June 8. Neither the CBI nor its Argentinean prosecutors Miguel Almeyra and Lilian Delgado got orders for appealing in the Supreme Court against the lower court’s order not granting the Indian plea for Quattrocchi’s extradition, sources said. Quattrocchi was detained at Iguazu airport in Argentina’s Misiones province on February 6 on the basis of a Red-Corner Notice issued by Interpol at the behest of the CBI. The businessman, who had earlier successfully fought a similar extradition battle against Malaysian authorities, maintained that he has been “a victim of an obsessive persecution” by Indian investigative authorities. It is understood that the Red Corner Notice against Quattrocchi will remain in effect for now. Indian Ambassador Pramanesh Rath said through a spokesperson that he would not like to comment on the issue. While the presiding judge in Eldorado, Mario Harichi Doi, refused to go into the accusations by Quattrocchi’s legal counsel that the motivations for his arrest were political, he cites “irregularities detected” in the CBI’s handling of the case in a written ruling. "I couldn't really say anything. I just pushed my head back then put my head down. I was so flabbergasted," said Angela Kelly (40), recounting the moment that she checked her ticket at work on Monday. The postal worker, from East Kilbride, near the western Scottish city of Glasgow, said her hands were shaking as she got work colleagues to double check whether she had not made a mistake. 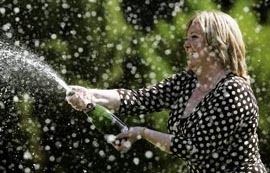 She then told her son John (14), by telephone, "We've had a wee win in the lottery"
The windfall - still only the ninth-biggest payout won by single person in the nine-country lottery that has been operating since 2004 - catapults Kelly to the top of Britain's rich list of individual lottery winners. A year after the Likud was routed in the national election, Netanyahu has rebounded in opinion polls that have shown a steep plunge in the popularity of Prime Minister Ehud Olmert, who leads the centrist Kadima Party. Final official results of Tuesday’s Likud balloting gave Netanyahu 73.2 percent of the vote against his main challenger, West Bank settler Moshe Feiglin. “The internal battle ended tonight and tomorrow we will focus our efforts on bringing Israel a new leadership, Netanyahu (57), said in a victory speech. “I think that in a very persuasive and clear way we are striding along our centre path. I think the majority of the public wants it this way,” he said. Despite Netanyahu’s hawkish views, his 1996-1999 term as Prime Minister was marked by a handover of some occupied land to the Palestinians; the transfer of a part of the West Bank town of Hebron under pressure from Washington. Netanyahu quit Ariel Sharon’s government shortly before the withdrawal, cautioning that quitting the coastal territory unilaterally, 38 years after its capture in the 1967 Middle East war, would only reward Palestinian militants fighting Israel. Hamas immediately slammed the move as illegal and said an election cannot take place without the participation of their movement, which had swept to power after the last legislative poll a year-and-a-half ago.